The outer covering of embryo is called Zona pellucida which is a cover protecting the integrity of the blastomeres inside. They should be dissolved or breached before the embryo / blastocyst get attached with endometrial lining of uterus for proper nidation. When they are resistant for natural enzymes in the endometrial cavity which help in dissolving this, or when the women concerned is aged whose eggs may have harder thicker zona, we may have to dissolve the zona partially before transferring them in to uterus. It is believed to help nidation in time. “LASER ASSISTED HATCHING” system, augments the success rates significantly by improving the implantation rates. 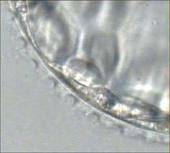 This technique helps the blastocyst to hatch in time, by which the implantation potential is improved. This procedure will help the eggs of elderly women whose eggs will have thicker ZONA PELLUCIDA. Cryopreserved Embryos and Blastocyst also have thicker ZONA, which will be helped out by this procedure.